While we are so quick to point out the negatives of taxation, the TTC, Construction in the summer, St Clair business and road expansion, The Roncesvalles reconstruction, Metrolinx rail land use for a commuters lines to the airport and a variety of Hot Button issues. 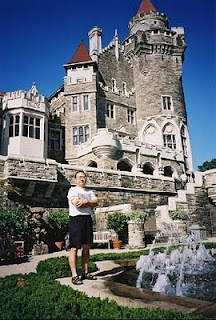 Joe Mihevc attended at a Networking Meeting Up and Dinner at Casa Loma this past May 20th, (This event is held monthly and hosted by the Kiwanis Club of Casa Loma.) and [he] spoke from the perspective of the glass is half full. In a cheerful and articulate presentation Mr. Mihevc made some interesting points about life and opportunities in Toronto. One of the lowest crime rates of any city of comparable size. Readers Digest surveyed 32 cities in the world leaving wallets in public places to see which ones would be returned. Toronto came in second after Ljubljana, Slovenia. 4 – Culturally, Toeonto is a mecca with 100 festival, 125 musems, 50 ballet and dance companies, 6 opera companies, the third largest centre for film and TV in the world, the third largest English language Theatre market in the world. 9 – Moodys has rated only 3 banks in North America are AAA; two are Canadian, TD and the Royal. There is much to be proud of with our city. It is a point worth remembering when the media focuses on the negatives. Mr. Mhevic pointed out very accurately that the business and employment opportunities combined with financial stability and head offices of our financial institutions make Toronto the Mecca for seeking employment. Our stability in banking, legal systems and real estate are constantly proving to be good investments. Toronto is in the Top 3 in North America grouped with San Francisco and New York City as growing and prosperous Knowledge Based economies. Yes there are things that need attention, So.. lets work on them.